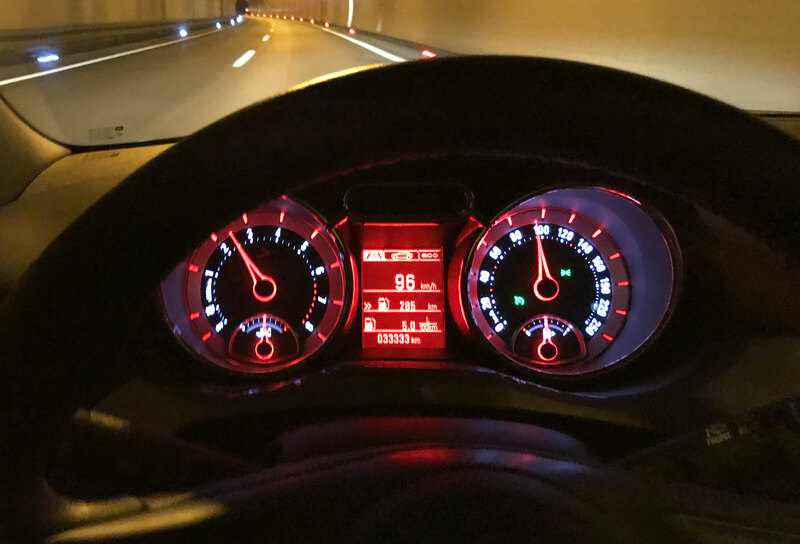 Opel Adam S driven for 33333km - my experience | fischirocks! So, I pushed pretty much everything that was available into my car, because I wanted it to be comfortable. For me as a musician, a good and powerful sound system was a must. Because I am nearly deaf 😉 I also skipped the really good seats, because it was not possible to have them heated – which is important in Austria’s winter. Although this is a really small car, there is a lot of space inside. For two people. Anybody sitting in the back will get some cramps after a few minutes, so these seats are just for emergencies. I do not really care about that, as I want to have a car that fits just me and maybe one more person. With the back seats folded down, I can get my whole music equipment into the trunk, and my record was transporting 10 cases of beer. Or a lot of junk food, back in the days when I had the football bar in Mieming. The car’s small but good and sporty looks result in a lot of conversations about it. I am always pleased to show people why I chose the Opel Adam S.
I had Opel OnStar included for the first months, but did not find it necessary to pay 10€ per month, for not much extra value. It was fun annoying my neighbors with the remote horn, while I logged into the app in a WLAN on Mallorca, but that was about everything I used it for. The onboard information system delivers nice insights about the status of the car, with the tire pressure control being my favourite tool. For a small car, the doors are quite big. You may not need much space for parking, but the doors swing out a respectable distance. After one and a half year, I can start to see damages in the painting of the hood. I know that this is normal, but it still is a pity. The rest does what it should – heating, climate control, wipers, … Nothing too special, but just what you need. I was never a fan of driving, and always took it as a necessity to get from A to B. But when I first drove my new, light and powerful car, I really got into enjoying stepping on the gas pedal, especially with the ESP turned off. Overtaking cars and finding parking spots was never easier, and sitting in the Adam for a long period does not make it uncomfortable. The control of the steering is great too, and the brakes really bite into your speed. Over time you do not realize the direct control, easy steering and power of the Opel Adam S any more. Until you rented a car in Senegal, or took your mom’s ride for a drive. You’ll be happy to switch back to your little powermachine afterwards. As I packed my Opel Adam S with some extras, I thought I mention a few words about them individually. Where to start with the amazing idea to put heating into the steering wheel. I am so happy for this extra. In winter, at -10°C, you need just around one minute to have a comfortable experience. The seat heating works good as well, although it is not adjustable. ON/OFF are the only options. Works great with a mobile phone for navigation. I really do not know why anyone would buy a built in navigation anymore. Mainly I use it to listen to podcasts and audiobooks (at the moment: Corruption by Don Winslow) while driving from and to work. Most options remain unused, as it never crossed my mind to use the display for showing photos. Never used. Probably never will. This is really nice. Absolutely unnecessary, but the light blue light it produces looks stunning. I could switch to other colours, but – it’s blue. Also not really necessary, as parking is really easy with this small car. The sensors also do not work really accurate, and produce loud warning sounds almost a whole meter from an obstacle. Yeah! Also really glad I got this extra. I like good sound, and Infinity provides. One more thing that I don’t realize too much. The brightness inside the car feels really good, but I have yet to see a shooting star through it. Black, and look good. Did I already mention that I like black and blue? I am really disappointed in that, as I did not get it to work properly with my former phone, a Samsung Galaxy S7 Edge. I do not know if it was the phone or the charger, as I do not own a wireless charging phone anymore. The size of the platform is big enough and it should easily hold a phone that is even bigger than the S7E. Looks. It is just my cup of tea. TL;DR; – at the moment this is just the right car for me. It’s got power, good looks and a reasonable price tag. Fortunately I do not have kids, and I don’t plan to have some. So if you just need to drive around alone or with another person, and like the sporty feeling, it may as well be a car for you.